Almost half of adults in emerging economies still lack basic financial services. Here are five ways to help more people benefit from digital finance. 1) Make sure digital technology is available to everyone. Accessing economic opportunities increasingly depends on access to technology. These days, everything from job searching to managing money is done through mobile phones and the internet. The millions who lack digital technology are at a big disadvantage. In our set of major emerging economies, the share of adults with their own mobile phone ranges from 61% in Mexico to more than 90% in China and the Russian Federation. The internet is less widespread, even among people who have a mobile phone. About three-quarters of adults in India have their own mobile phone, for example, but only a fraction have both a mobile and the internet. In recent years more and more people in emerging countries have logged on via mobile broadband – but there's still a long way to go. Women are less likely to have a mobile phone than men – and that makes it harder for women to take control of their economic lives. The mobile money industry group GSMA surveyed working women in a set of major emerging economies and found that two-thirds believed that mobile phones helped them get access to business and employment opportunities. Yet roughly 200 million fewer women than men own a mobile phone, the GSMA estimates, and women won't be able to fully benefit from much-vaunted innovations in mobile financial services unless that inequality is curbed. Poor people continue to trail the rich in mobile phone ownership. In sub-Saharan Africa, about three-fourths of wealthier adults have their own mobile phone, versus roughly half of poorer adults. That gap is eight percentage points in East Asia and the Pacific. 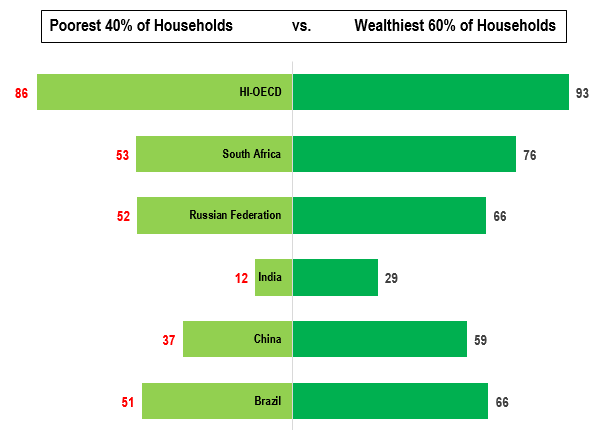 Not surprisingly, the rich are much more likely than the poor to use digital payments. 2) Take advantage of biometrics to serve the poor. About a fifth of the world's 2 billion unbanked adults say one reason they lack an account is that they do not have the documentation needed to open one. India points the way to a solution: using digital forms of identification, like fingerprint or iris scans, to help people get basic accounts. Biometrics also can be used by women to register SIM cards in their own name so they don't have to rely on a relative's cellphone. Accounts set up with biometric capabilities are often easier to use. For example, people who struggle to remember long PIN numbers might prefer fingerprint scans as an alternative. 3) Ramp up use of direct deposit by the private sector. The biggest opportunity to help poor people get good financial services arguably lies with large employers paying electronic wages and large buyers paying suppliers directly into an account. Governments are way ahead of the private sector when it comes to use of digital payments, and in emerging economies, most wage earners are still paid in cash. About 7 million unbanked adults in Mexico work in the private sector and get paid in cash, and in Brazil, that number hits 8 million. About 440 million unbanked farmers, including roughly 85 million in China, are compensated in cash. In addition to being more convenient, wringing these payments directly into an account might build food security by helping farmers invest in their crops. East Africa shows that digital payments can be made to farmers: Over 10% of adults in Kenya, Tanzania, and Uganda receive a payment for the sale of agricultural products directly into an account. 4) Stop using cash to distribute social benefits and pay government employees. Digitizing government payments is a proven way to expand financial access. As shown in the chart below, at least half of account holders in Brazil, Mexico, the Russian Federation and South Africa use their account to receive public sector wages or safety net transfers (the blue bars). Furthermore, around 15% of banked adults in these countries opened their first account in order to receive this payment (the dotted blue bar). But loads of unbanked adults still collect government wages or benefits in cash. Moving those payments into accounts could help an additional 160 million unbanked adults get an account, including about 28 million in China, and almost 7 million in the Russian Federation. As an added bonus, digitizing payments has been shown to slash costs and cut corruption . 5) Treat customers fairly and tailor products to their specific needs. Poor people won't benefit from financial access unless accounts are cheaper and easier to use than the alternatives. Shoddy products, allegations of fraud, and bad infrastructure have left some recipients of digital government payments nostalgic for cash. Keeping services affordable and quickly dealing with customer complaints will shore up trust and help draw new people into the formal financial system. Businesses also should understand that not everyone's financial needs are alike. Women's concerns are distinct from those of men, and the lack of products designed with women in mind is one reason so many remain unbanked. One size fits all approaches won't do much to help increase usage of digital finance - no matter how you measure it.